On a fresh Michigan afternoon in October, more than two thousand Scientologists and guests gather at the cornerstone of downtown Detroit to commemorate the grand opening of Motor City’s majestic Church of Scientology. The audience rises to their feet welcoming Mr. David Miscavige, Chairman of the Board Religious Technology Center, at the dedication ceremony of the city’s new Church of Scientology. 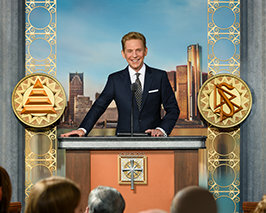 Mr. Miscavige addresses the multitude in the heart of downtown Detroit on Sunday, October 14. Flanked by those parishioners who helped make their new home an eight-story reality, Mr. Miscavige officially dedicates Motown’s magnificent Scientology Church. The cheers ring out as the glorious new 55,000-square-foot Church of Scientology is unveiled before Detroit, Michigan. Mr. David Miscavige with (left to right): Allison Folmar, Civil Rights Attorney; Hubert Roberts, Mentor Director of the youth empowerment project InvolvedDad; Artina Hardman, Michigan State Representative of District 3 (ret. ); and Steven Spreitzer, the President of the Michigan Roundtable for Diversity and Inclusion. Attendees tour the elegant eight-story building that is now home to the Church of Scientology. A sight to behold—parishioners enjoy the beautifully appointed and newly restored city landmark in downtown Detroit. Detroit—America’s love of cars was born here; Motown, the sound of her music was formed here; and World Boxing Champion Joe Louis, one of her first African-American sports heroes, was from here. Once the nation’s fourth most populous city, home of the most successful industry in the country and site of some of the largest peaceful civil rights demonstrations in the nation’s history, led by Rev. Martin Luther King Jr., Detroit has also seen troubled times. But just like native son and heavyweight champ Louis, Detroit was down, but not out. Now, it is “America’s Comeback City,” as scores of locals and believers from all over are showing faith in the Motor City, determined to put the mojo back into Motown. Today the drive to “take back Detroit” is fueled by a fiercely contagious pride, and the Church of Scientology is a vibrant part of the engine powering that effort. A presence in the city since 1963, it was on a bright fall Sunday in mid-October that a crowd of more than 2,000 gathered at Jefferson Avenue and Griswold Street downtown to celebrate a glorious new Church come to life. “You Can’t Hurry Love” as the song goes, but for all those in attendance there was “Dancing in the Streets.” The grand opening pulsed into motion with the iconic sounds of Motown and quickly segued into a variety of community and civic leaders extending congratulations. The backdrop of the grand celebration was the eight-story Church of Scientology just east of the 150 West Jefferson skyscraper and directly across from Detroit’s Hart Plaza. The location is a true cornerstone—site of the first building in Fort Pontchartrain—which would later become the city of Detroit. While, to add further meaning to the story, that inaugural building was also the city’s first church, constructed in 1701. Today, the magnificent 55,000-square-foot landmark that occupies No.1 Griswold Boulevard dates from 1927. Working with local artisans, the Church meticulously restored the landmark’s intricate details—from her ceiling murals and brass details adorning her neoclassical interiors, to the exterior limestone and ironwork designed by Corrado Parducci—a man who has practically defined the face of downtown Detroit—not to mention the building’s corner clock that has been a familiar face to residents for over 50 years. As the Church of Scientology Detroit, the facility now stands poised to continue the religion’s history of service to America’s capital of courage and character. Indeed, the work of the Church and Church-sponsored organizations has long been established here, from the distribution of thousands of The Truth About Drugs booklets, to a Way to Happiness movement blanketing city streets with thousands of copies of L. Ron Hubbard’s common sense guide to better living, in addition to Scientologists partnering with local legislators supporting freedom of religion. Among area leaders on Sunday who welcomed the Church to its new facility were Steven Spreitzer, the President of the Michigan Roundtable for Diversity and Inclusion; Hubert Roberts, Mentor Director of the youth empowerment project InvolvedDad; Civil Rights Attorney Allison Folmar; and Artina Hardman, Michigan State Representative of District 3 (ret.) and current Executive Director of city resource center Mack Alive. All spoke of their enduring experiences working with members of the Church of Scientology. Upon entering the new Church of Scientology Detroit, visitors are welcomed by a Public Information Center presenting an introduction to Dianetics and Scientology. Its displays, containing more than 500 films in 17 languages, share the beliefs and practices of the Scientology religion and the life and legacy of Founder L. Ron Hubbard. Detroit’s Chapel provides for Scientology congregational gatherings that include Sunday Services, Weddings and Naming Ceremonies, as well as a host of community-wide events such as banquets, seminars and workshops, open to members of all denominations. Also featured are well over a dozen specially appointed rooms providing the ideal setting for Scientology auditing (spiritual counseling). Multiple course rooms are also dedicated to training auditors (spiritual counselors) and for Scientologists studying the technology of auditing; and all to help others attain spiritual freedom. The new facility welcomes both Scientologists and those interested in learning more about the Church of Scientology. This opening of the new Detroit Church of Scientology powers forward a period of expansion for the religion, with nearly 70 new churches of Scientology in global cities—from Los Angeles to London, Bogotá to Berlin and Tel Aviv to Tokyo. In just the past year, new Churches of Scientology have opened in Dublin, Ireland; Birmingham, England; Amsterdam, Netherlands; Johannesburg North, South Africa; Salt Lake City, Utah; Silicon Valley, California; Perth, Australia; Orlando, Florida; and Stuttgart, Germany. More Church openings are planned in the coming months for cities in Europe, North America, Latin America and Africa.